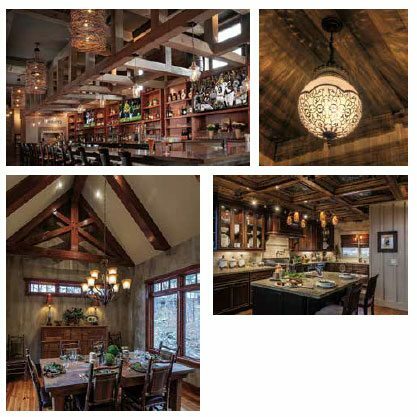 The Tricky Job of Lighting Our Rustic Mountain Log Homes. Lighting design is the one element of interior design that can make or break a beautifully designed interior space. Lighting provides so much more than a simple glow. Subliminally, lighting impacts how we feel and impacts our emotions, our comfort level and our ability to do tasks. Of all elements to be incorporated into a design, lighting is the most important. Lighting is not something to think about as finishes are being installed. Nor is it simply picking out the fixtures at a local lighting store. Lighting design starts early in the design process. Good lighting results from a well thought out process that includes spatial function analysis, determination of types of lighting needed for each area, layout and detailing of the lighting plan and finally, selection of fixtures and bulbs. There are three distinct lighting types involved in lighting design. First is ambient or general illumination. This is the large overhead chandelier that adds a glow or “ambience” to a room. The second is task lighting that is for lighting a specific task area such as a reading lamp. And the third is accent lighting which illuminates artwork or special architectural features. Within these three types of lighting, there are many design directions you can take within the layout of fixture(s) and fixture selection. Creative lighting not only provides light, but can add decorative elements to empty space and create the personality of a space. Highly decorative fixtures such as the twig and vine chandeliers in Chester’s animate large spatial voids in rooms but they only provide a soft glow to the space, not enough light to read a menu from. A common mistake is when chandeliers are installed over dining tables with the light sources pointing up preventing adequate light from reaching the table. In this situation, then secondary lighting called task lighting should be added. Recessed or surface mounted mini spots over dining tables on either side of chandeliers to blast the table top with light will work. Mountain homes with wood interiors that are brown or gray have to have a lot of light. Great rooms with intricate ceilings and beams are too often lit incorrectly. Recessed spot lights on high sloped ceilings create a terrible glare and leave the beautiful wood ceilings in the dark. Light from the recessed downlights in tall vaulted spaces dissipates before reaching the floor area. These ceilings should be illuminated with up lights from spots that accent the ceilings then add task lighting throughout such as table lamps add blasts of light where you need it. Chester’s has spot lights strategically placed throughout to illuminate all the art and architectural features. If focal points are scattered throughout a space and illuminated properly then your eye is excited and wanders around the room making the space more interesting. At Chester’s we hid spot lights in the beams to illuminate the artwork, bar top and the back bar. These spots also crisscross over the beams giving lots of dramatic light and shadow. The back feature wall is illuminated by high wattage spots placed closed to the wall surface on the ceiling plane that “graze” the textured surface creating intense light and shadows on the carved surface mounted on the wall.